Searching through the news archives, we came across an October 1972 article from the Los Angeles Times penned by writer Bill Libby titled "Reluctant All-American: The games Bill Walton plays." Bill Walton was just 19 years old at the time and ready to embark on his second season at UCLA under Coach John Wooden. Just seven months earlier, he had helped lead the Bruins to an eighth NCAA basketball championship. 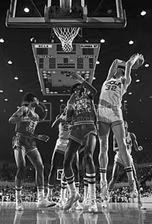 In the article, the strapping 6'11 All-American center shared his thoughts about teammates, Coach Wooden, and his experiences as a collegiate basketball player. He shakes his head and says, "I'm just starting in sports and already I'm being called a superstar. It's just not right. I don't like it when everyone wants to interview me and no one pays any attention to my teammates. Without them, I'd be nothing. This is a team game, and I'm just one of the guys on our team." "I don't go out on the court to impress anyone. I just try to play my game and help us win. I'm sorry that I stand out. It hurts when people talk as if I'm the only player on the team. I wish that sportswriters wouldn't ask me anything personally at all. I'd prefer that they get the whole team together to talk. I don't like to be singled out as an individual because I don't play as an individual. We play as a team." "I don't give many interviews, because I don't think I'm all that important. I don't want to be made into some kind of cardboard cutout, and I don't want people to be disappointed when they find out that I'm something other than what they want me to be." "The other regulars have been high school stars, big men all the way until now. Here they've been asked to sacrifice themselves, and they've been shoved into the shadows, yet it hasn't affected their desire or altered their personalities. They've been just great, and I think that what they've had to do is a lot more admirable than anything I've done." "I have been very fortunate with all my coaches. They all have done their best for me. Coach Wooden is a very good person. He coaches the whole person, not just the player. We disagree on many things. For instance, I wish he didn't insist on short hair. But he is not one of our generation, so I cant expect him to see things as we see them. And he is a very logical man. When we discuss things with him and can explain something logically, he is prepared to go along with us." "Walton fostered a spirit of togetherness that helped build an unusual team spirit." "This has been the most compatible team we've had since I've been here, largely because of Bill's personality and unselfish attitude towards his teammates." Libby wrote: He says that he knows that if there is a merger between the warring pro leagues he will not be offered as much money to sign as he has been offered already, but he says that he doesn't care. He says, "I figure I still have to put on weight and get stronger and get better as a player. When the time comes to play, if I want to play pro, I'll be able to get the money, but money and material things simply don't mean that much to me." I think the current Bruins could learn a little bit about team attitude from 19 year old Walton. Great story. Is that why Love's name is missing from the listing of UCLA players? Are Bruin fans making these posts about Love? Folks, coach Howland was complaining that Kevin was not been fed the ball on the post. I'm not going to disagree with the coach. I've not heard Kevin Love complain about not getting the ball. I don't think Kevin Love has said anything of that sort. The Bruins play great together as a team and they are one of the most unselfish teams in the NCAA today. Is that why Love's name is missing from the listing of UCLA players?" No, only players who have earned varsity letter from UCLA are shown in the complete player listing. Love has not earned a letter yet.